Dear Parents,Greetings of peace!We have breezed through the First Quarter of the Scholastic Year 2008-2009 and it is now time for our students, your sons to reap the fruits of what they have sown in their studies for these past three months. This Sunday, will be a special day in this regard; it will be the time to gather the parents of our Bosconians once again. We will have a GENERAL ASSEMBLY OF PARENTS this Sunday, September 7 at the Don Bosco College Gymnasium. We take advantage of this assembly to have the thanksgiving mass of our new priest, Rev. Fr. Keith Michael T. Simbulan, SDB, our very own Assistant Principal for Pastoral Affairs (APPA) with the parents. Fr. Kim, as he is fondly called, was recently ordained—last August 16—at the National Shrine of Mary Help of Christians, in Parañaque. With the Mass of the newly ordained comes a lot of blessings and graces. Likewise, we will hold in this occasion a short formation of the parents immediately after the Mass. It will be in the form of a thirty minute talk about “What Makes Don Bosco Special”, or what makes your son’s school different from other schools. 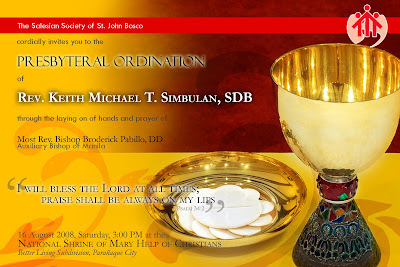 This will be conducted by Fr. Dennis Sylvester Casaclang, SDB. Note: Only parents or guardians who sign the diary will be allowed to claim the Report Card. The giving of report cards will only be until 12:00 noon. Thank you very much for your support and cooperation. God bless you! 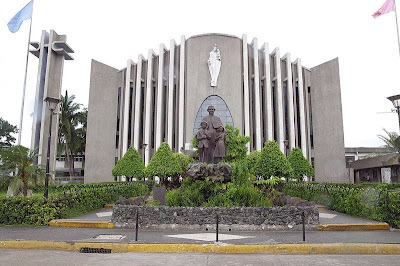 Last August 16, 2008, the day after the feast of the Assumption and day of commemoration of the 197th birthday of Don Bosco marked an important day for the students and teachers of Don Bosco College High School Department. 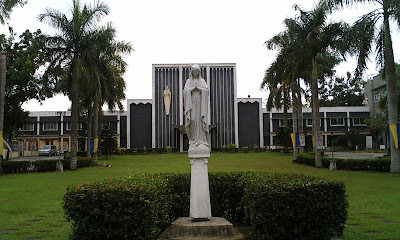 It was the first ever Marian pilgrimage for Bosconians in its 10 years of existence as a high school department. They called the event 'Shrine to Shrine' as it moved from the Diocesan Shrine of MHC in Canlubang to the National Shrine of MHC at Parañaque. The pilgrimage began with a talk from Bro. Jomar Castillo, SDB, a member of the pioneer batch from the High School and now a Salesian Brother. He shared with the HS students his insightful memories of the Canlubang MHC Shrine, which has become instrumental in deepening his devotion to Mary and led him to discover his Salesian vocation. The pilgrimage was led by two pioneer teachers, Ms. Iryne Decena and Mrs. Julita Manaig. The fact that it also corresponded nicely with Fr Kim's ordination was not by chance. He was their very own 'Catechist', and the school was there to support him. It is also a good thing to note that in 1998 the department only started with one class consisting of 48 students with a handful of Salesian and lay teachers. Now the department has 10 sections for its tenth year and still growing as it marked another milestone in the history of Don Bosco Canlubang. Don Bosco high school boasts of its graduates now holding key positions in different fields in society here and abroad, and even joining the best in national board examinations. This is only a proof that Bosconians live by their motto Ad Maiora Natus. We have a new priest in our midst! He is Fr. Keith Michael T. Simbulan, or Fr. Kim. The whole of the High School Department had the grace to witness the important event of Fr. Kim's ordination to the priesthood last August 16, 2008.